ANANTARA HOTELS, Resorts & Spas, with a decade-long history of immersing itself in local initiatives that benefit the environment and local communities, has brought all these good deeds together with the launch of its 365 Days of Good Deeds Sustainability Program. Under this program, at least one good deed will be done every day in 2012 – whether rescuing street elephants in Thailand, coral rejuvenation in Phuket or supporting local farmers in Indonesia, Anantara will carry out this program at the grassroots level in each of its exotic locations around the world. Anantara is also inviting its guests to combine their five-star journey of local traditions and natural wonders with the opportunity to participate in a range of good deeds that help the communities in each locale, both socially and environmentally. In the heart of Thailand’s northern jungle and hill people tribe country at Anantara Golden Triangle Resort & Spa, the on-site Anantara Elephant Camp is a traditional mahout (caregiver) and elephant village, which is completely self-supportive. 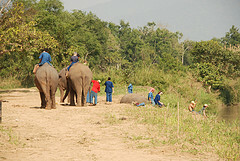 Guests can visit, feed, bath and do mahout training programs with the 30 elephants rescued from Thailand’s city streets. The elephants enjoy a safe and natural place to stay, guaranteed fodder and shelter and the mahout and his family receive employment, housing, medical insurance and schooling for their children. Anantara Phuket Villas, together with the Mai Khao Marine Turtle Foundation, reintroduced endangered baby turles to their natural environment on Mai Khao Beach – one of the few Phuket beaches that continue to be available to nesting turtles. All the eggs are rescued from the beaches surrounding Phuket and nearby provinces, where a natural and peaceful existence can no longer be guaranteed. Anantara’s hotels and resorts are based in some of the most exotic locations in the world. Anantara believes the indigenous surroundings and experiences at each destination offer “a compelling reason for associates and guests alike to want to preserve them forever … and that these unique experiences not only provide guests with a memorable holiday experience but knowing that they have given back to the environment and the local community”. For more information, call 66 (0) 2 365 7500.